Boerboels or more commonly known as the South African Mastiff is a dog breed that is known for guarding homes. 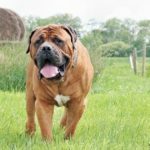 They are one of the most powerful breeds of dogs and they are also used by farmers. In fact, the word “boer” is the Dutch word for farmer. You can read more about them in this link here. The Boerboel has a very strong bone structure, blocky head, well-developed muscles, and a short length. The male Boerboels are more balanced and bigger than the female ones. They are very easy to groom and an occasional monthly trim is all they need. The coat is coarse, shiny, soft, smooth and short. They are intelligent, charming, and loyal. They are also great with children.